Ubisoft have released the official system requirements for Watch Dogs, and as expected, they are pretty hefty. 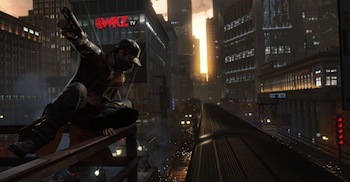 If you are still using a PC from 2005 that runs on the 32-bit version of Windows, you may want to consider upgrading if you plan on playing Ubisoft's new sandbox hacking game Watch Dogs. Ubisoft has unveiled the game's official PC system requirements, and as is expected considering the amazing graphical fidelity we've seen in trailers so far, they are quite hefty. At minimum, you'll need a 64-bit version of Windows, a quad-core CPU, a Direct X 11-capable graphics card with at least 1 GB of Video RAM, and at least 4 GB of standard RAM. Ubisoft gives the Nvidia GTX 460 or the AMD Radeon HD 5770 as examples of cards that hit the minimum requirements. As for the recommended requirements, Ubisoft suggests at least 8 GB of RAM, an 8-core CPU, and a graphics card with at least 2 GB of video RAM, such as the Nvidia GTX 560 or the AMD Radeon HD 7850. They've also released a third set of requirements, the "Ultra" specification, for those of you who want to melt your PC. The ultra specification recommends an 8-core-plus CPU, coupled with the Nvidia GTX 670 or the AMD Radeon HD 7970. For those of you who have been quite happily sitting on older systems that have out-paced current-gen consoles for years, this is your wakeup call that next-gen is finally here, and developers are actually designing games for higher-end PCs once more. Looks like the game's specs won't be quite so demanding after all. Sebastien Viard, the graphics technical director for Watch Dogs, has Tweeted: "Hello. It is not the official configs. The real specs will come out soon and will be lower than these :)".